Do you ever feel like you are totally misunderstood? I’m not talking about the teenage angst type of misunderstood where you lock yourself in your bedroom, listening to sad music, crying about how no-one really “gets” you. I’m talking more about the “oh shoot- I’m not really what you think I am” kind of misunderstood. I was recently introduced to a friend of a friend and in the introduction process, “old friend” was saying some very nice things to “new friend” about my cooking. After hearing the compliment, “new friend” snorted at me and began saying things like “It must be nice to be a stay at home Mom”, “Yeah, I wish I had all day to cook and make fancy meals”, “Oh just wait until you’re actually working full time. Then we’ll see how “fancy” your cooking is”. I politely smiled as she lamented about how different our lives were and how much harder it was for her to make healthy lifestyle changes because of the many limitations our differences caused. As I was listening to her speak, I was thinking about how many times I have heard similar comments from people, and I started to realize that it is time for a confession. Contrary to popular belief, I do not spend hours in my kitchen wearing a hand sewn apron, sifting flour and making homemade jam. Don’t get me wrong – that sounds amazing! :) The truth is, from the time my three year old wakes me up at 6am I am frantically racing around my house packing last minute school lunches, searching for missing uniform pieces and struggling to get breakfast on the table before it’s time to get out the door to get my daughter to school on time. Once we are finally out the door and in the car the real fun begins as I attempt to complete my “to do list” and actually accomplish everything I’ve overcommitted to. Most days I blink twice and it’s 4:45 PM and I have no idea what I’m making for dinner. I do not spend all day in the kitchen and I do not have it all together – not even close! 🙂 So whats my secret?..I’ve been cheating. That’s right: in order to eat healthy – I cheat. I make the simplest things I can find that require the fewest ingredients and yet they LOOK and TASTE like I’ve spent all day in the kitchen! Here is an example of one of my favourite “cheat” recipes (actually I’m not even sure if this qualifies as a “recipe” because it’s SO easy). 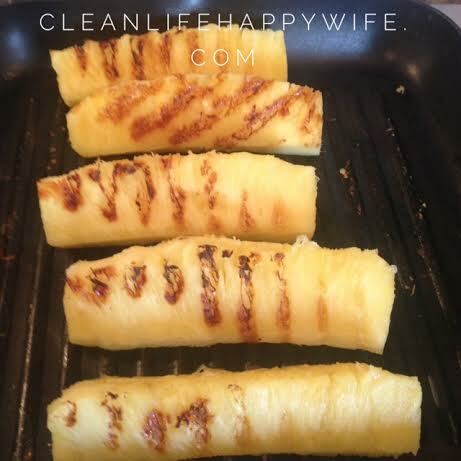 Directions: Slice pineapple and grill on George Foreman grill or BBQ for 8 minutes. You hit the nail on the head Pam! Being a SAHM is far from luxury……everyone has to do what it takes to get through the day. I’m sure you’d agree that sometimes working outside the home seems like a glorious “break” too 😉 hang in there everyone! Support each other, don’t judge or assume. We’re all doing our best. Love your transparency . love your blog . and love grilled pineapple. Simple isn’t cheating BTW…its smart. Keep doing what you do. Awe thank you! I’ve been waiting for this warmer weather so that I can finally pull out my BBQ! I grill everything! Fruits and Veggies! Somehow it makes them seem like more of a treat! 🙂 Thank you for reading! So I am one of those working moms who is desperately trying to balance it all. The hard part for us is that we have the same long list but far less one to get it done. In fact, I don’t begin the majority of my list until after bedtime when I would love to be relaxing or when I wake up long enough before my kids to get things done. This is my reality – not my excuse so I would love to hear from some working moms who have found some effective ways to prepare and/or maintain a clean eating lifestyle while still managing to keep a healthy balance with work and family.